RIR looks into the construction of 10 new stadiums for the football World Cup, who is building them, and how much these large-scale projects will cost. The Russian Minister of Sport Vitaly Mutko has once again reviewed the cost of staging the FIFA World Cup in Russia in 2018. According to the timetable, the cost of completing the program to prepare for the tournament has dropped by 44 billion rubles ($1.3 billion) and is now 620 billion rubles ($17.5 billion). Experience, however, has shown that the total cost of building a stadium in Russia is always very different from that projected in initial estimates, therefore the final cost of the project remains a matter of conjecture. In January 2014, the General Secretary of FIFA Jerome Valcke announced that Russia is 6-8 months ahead of schedule in its preparations for the World Cup in 2018. “Aside from the stadiums we have to construct over 300 projects: accommodation facilities for the players, as well as communications and power engineering installations,” explained Mutko. He went on to dismiss any suggestions of potential corruption or delays to the schedule. The Kazan Arena, the first of 12 stadiums for the 2018 World Cup, is now ready for use, and will host its debut match on May 26. The Kazan Arena is designed for 45,000 spectators and is reminiscent of one of world’s best stadiums, the home of London club Arsenal FC - the Emirates Stadium. The similarity is no accident, as the company who worked on the Kazan stadium project also designed the Arsenal stadium, the new Wembley and the Olympic Stadium in London. The Kazan Arena cost 14.3 billion rubles ($402 million). By comparison, similar capacity stadiums in Brazil built for the World Cup in 2014 cost the host nation much less: the 45,000-seater Arena Das Dunas stadium cost $205 million, the 44,000-seater Arena Amazonia stadium cost $260 million and the 44,000-seater Arena Pantanalan stadium came in at $255 million. The cost of the stadium in Kazan is similar to that of the Brazilian stadiums that will host the decisive matches of the 2014 competition, such as the 71,000-seater Mane Garrincha National Stadium where the quarter-finals and third-place play-off will be held, which cost $400 million. Construction of the 65,000-seater Arena Corinthians, which will host one of the semi-final matches of the tournament, turned out to be slightly more expensive at $403 million. 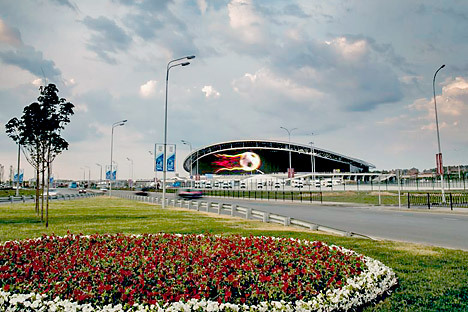 The Fisht stadium in Sochi, where the opening and closing ceremonies of the Olympic and Paralympic games were held, is also ready to host soccer matches. It was designed by architectural firm Popoulous, whose portfolio includes the Yankee Stadium in New York, the Olympic Stadium in Chicago and the So Kon Po stadium in Hong Kong. “The stadium is designed so that in the winter it reflects light at a specific angle, so that the sun can penetrate inside. In the summer when the sun is high in the sky, it will provide the building with shade,” Populous director Damon Lavelle said. If the stadiums in Kazan and Sochi are ready to host matches at the highest level, in other Russian cities progress is slower. The closest of these to completion is FC Spartak Moscow’s new stadium, the Otkrytie Arena. This stadium is due to open at the end of July 2014. The long-suffering Zenit Arena in St. Petersburg however, which has been under construction since 2006, will only be ready by mid-2016. Another Moscow venue – the legendary Luzhniki Stadium, which hosted the Olympics in 1980, is not going to be ready anytime soon. is now closed for reconstruction and 19,000,000,000 rubles ($534,000,000) have been allocated for this over four years. It is in the new Luzhniki Stadium that the World Cup final will take place. Russian companies have been contracted to build the stadiums in Russia’s regions. The construction of the stadiums in Nizhny Novgorod and Volgograd will be undertaken by Gennady Timchenko’s Stroytransgaz, the Crocus Group (owned by Aras and Emin Alagarov) will act as principal contractor in Kaliningrad and Rostov on Don, while in Yekaterinburg reconstruction will be undertaken by Sinara-Development, owned by Dmitry Pumpyanski. “Russia’s regions have ordered these stadiums. Our aim is to ensure that the stadiums they ordered from us pass FIFA inspections,” said Minister of Sport Mutko. “Regional government will take personal responsibility for these projects,” he added. The 2014 World Cup, which is due to take place in Brazil, cost the host nation around $20 billion. Five new stadiums were built especially for the tournament. In Russia, 10 new stadiums will be built especially for the World Cup in 2018. The Russian government has studied the Brazilian experience of preparing for the 2014 World Cup carefully and will do everything it can to ensure that the mistakes made by the Latin Americans are not repeated. "Infrastructure is one of the main problems in Russian football,” noted Anatoly Vorobyov, general secretary of the Russian Football Union, in an interview with an RIR correspondent. “Only one stadium, Lokomotiv, has been built since the 1980 Olympics and today Moscow clubs are forced to play in Khimki or Ramenskoye in the Moscow Region,” he said. “The organization of a domestic World Cup should change this situation. Russia should learn from the experience of Ukraine, which only just managed to hand over her stadiums for Euro 2012 at the last moment. The experience of the Olympics in Sochi, however, shows that our infrastructure needs to be in order,” said Vorobyov.